But today when I was playing around with Artizen , was in for a pleasant surprise. I had just one jpeg image open and while going through the Menu (Modify -> Tone Mapping) saw the option ‘Tone Mapping’. It even automatically converts to 32 bit mode before applying ‘Tone Mapping’. I even tried converting a sample single exposure image to see the results (I tried some of the presets in the ‘pull down menu – TM Operator’ and settled for ‘Fattal’). In the below you can see that one half was created using multiple exposure (three -2,0 and 2 xp to be precise) and the other was created with a single exposure (0) shot with Artizen. mmm quiet interesting results. Though the image from the single exposure seems to be washed out , I think it could be fixed with little post processing. So does it mean that we really do not need multiple exposure for creating a HDR. IMO (In my opinion) I would prefer multiple exposure. Before plunging into it lets gather some technical stuff here. 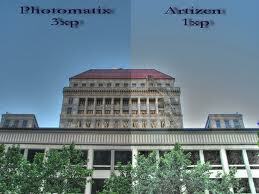 HDR – High Dynamic Range – as the name suggests is capable of storing high values of dynamic range. But most of the medium (lcd, crt or even print & paper) are not capable of displaying such high dynamic ranges. So to make these images compatible with the current mediums , a process called ‘Tone Mapping’ is generally used. Tone Mapping – as read from wikipedia – Tone mapping is a computer graphics technique used to approximate the appearance of high dynamic range images in media with a more limited dynamic range. Print-outs, CRT or LCD monitors, and projectors all have a very limited dynamic range. Hence, to me, the single shot stuff does not really enhance the Dynamic Range of the image and hence does not produce desirable results always. So as I said , I would still prefer multiple exposure for creating the HDRs, but again it would be on a case-by-case basis. 1. Could be used with shots that contain action. Generally when taking multiple exposure, there tend to be some blur with the moving objects like the boy in this . 2. Could be used to take Panaromas. I found it extremely handy while trying out a HDR Panaroma. More on this later, for the time being u can refer to this shot . 2. Was not able to get ‘actual Range values’ [File -> Image Properties -> Dynamic Range] for the image created from a single exposure, since this is not actual HDR. But in many cases realized that the Range is not high enough, when created from a single exposure. Note : If you do not have Artizen, the same can be achieved from Photoshop or other tools too. First use the single exposure shot. Play with the exposure setting to create two additional shots one with under exposure and one with over exposure. Then follow the same procedure to get the HDR effect. Excellent information. I learned something today! Tx for leaving a comment , not just for the comment , but by the way of leaving a comment, u invited me to ur web, it is impressive & inspiring. Now I have to spend time there. Good work. I noticed that this is not the first time at all that you mention this topic. Why have you decided to write about it again?